THE award-winning BenRiach Distillery has today, 17th of July, released Batch 10 of its eagerly-anticipated single cask bottlings. Selected by Master Blender Billy Walker, the superlative twelve-expression batch from the Elgin distillery was bottled last month and all bottlings are available as of today. 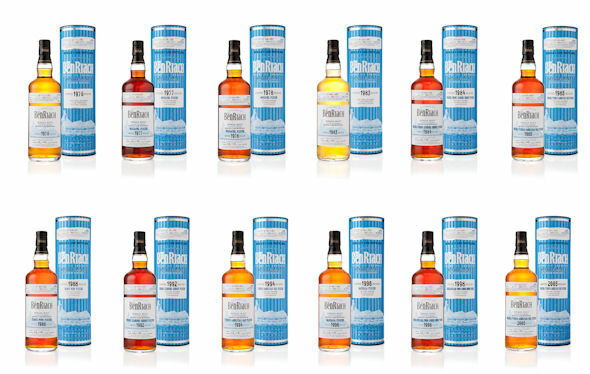 Batch 10 comprises sublime Speyside vintages ranging from 1976 to 2005. Cask types vary from Moscatel and Virgin American Oak Hogsheads to Pedro Ximenez Sherry Puncheons and Barrels. As always, they offer a mouth-watering range of classic BenRiach malt charm – zesty tropical fruits, dark roasted coffee beans, soft vanilla, banana, toffee, cinnamon…and even campfire-roasted apples with a touch of black pepper! Unusually for BenRiach, one expression - the 1998 cask # 7633 - has been triple-distilled. The taste is sensational – lively crisp pineapple explodes and gradually softens into creamy toffee. And also included in the new batch is an intriguing young 8 year old, an amazing 2005 cask # 3782 which is rich gold and, on the nose, bursts with sweet heather smoke, ripe soft fruits and a touch of citrus zest – ideal for summer drinking.